Plant Green Ideas RRR, in conjunction with the Chicago Cultural Mile, have installed fifteen sculptural heads on the Chicago Cultural Mile. The Chicago Cultural Mile is the part of Michigan Avenue stretching from the Chicago River south to Roosevelt Road. The art installation was announced at the site of the sculptural head sponsored by the Chicago Cultural Mile Association which is located across the street from their offices in the Fine Arts Building at 410 S. Michigan Avenue in Chicago. The Plant Green Ideas sculptural heads are the brain-child of Plant Green Ideas RRR, a Chicago not-for-profit committed to sustainability. The sculptural heads were constructed locally from sustainable materials by SVI Themed Construction Solutions. Each sculpture features a unique theme and message created with sustainable plantings and material. Sponsors of the artwork include, Walgreens, the Ford Motor Company, WGN-TV, Willis Tower and many more. The head-shaped planter sculptures are built from recycled aluminum, steel and sustainable concrete materials. Greenery and other plant materials donated by Ball Horticultural and Costa Farms are then added to complete the sculpture. Standing approximately 11 feet tall each, the sculptural heads are guaranteed to make their presence known. 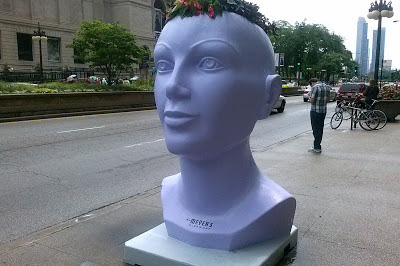 “We are excited to be hosting the Plant Green Ideas sculptural heads on the Chicago Cultural Mile. The dramatic art pieces are sure to delight and educate those who visit our area,” according to Sharene Shariatzadeh, executive director, Chicago Cultural Mile Association. “It is our goal that the Plant Green Ideas sculptural heads will inspire the community to contemplate new ways of thinking about and appreciating the environment that we share,” she added. “The Plant Green Ideas sculptural heads project will provide a dramatic statement on the Chicago Cultural Mile while stimulating interest and engagement in sustainable practices,” said Pamella Capitanini, co-founder, Plant Green Ideas. “It is also our intention to encourage thought and discussion of ways to make the world around us greener and healthier,” she added. Each planter is being fabricated with LEED certification standards in mind. If a planter was subject to the LEED standards used for buildings, it would quality for LEED credits in the categories of recycled content and rapidly renewable resources. The installation as a whole will contribute to a reduction in urban heat-island effect and increased storm water retention – each a potential LEED credit. Another noteworthy feature of the Plant Green Ideas installation is its ability to promote awareness and interaction through texting, social media and photos via QR codes. “This innovative and memorable artwork will provide educational content that will articulate actions that everyone can take to be more environmentally conscious,” according to Robin Malpass, co-founder, Plant Green Ideas. “We are thrilled to have this opportunity to engage Chicagoans and tourists alike and inspire them to think about our environment through art, social interaction, and education,” she concluded. During the plant green ideas installation, a mini Green Chia planter will be available to purchase exclusively in Chicago Walgreens at a cost of $19.95. The Green Chia is made by JEI, famous for the Chia Pets - is completely recyclable, and includes coloring pens to create your own green art planter. All net proceeds from the Green Chia's will be donated to SGA Children and Family services to benefit Chicago Children. For more information visit www.plantgreenideas.com and www.chicagoculturalmile.org.